The Project SEARCH High School Transition Program is a one-year internship program for students with disabilities, in their last year of high school. It is targeted for students whose goal is competitive employment. The program takes place in a healthcare, government, or other business setting where total immersion in the workplace facilitates the teaching and learning process, as well as the acquisition of employability and marketable work skills. Students participate in three internships to explore a variety of career paths. 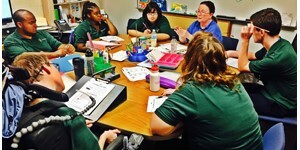 The students work with a team that includes their family, a special education teacher, and a job coach, as well as the Ohio Rehabilitation Services Commission (BVR), to create an employment goal and support the student during this important transition from school to work. Travel, fun and learning!! Our student interns had the great opportunity to travel to Columbus and stay overnight, make new friends and learn. Project Search highlighted in the August 31, 2016 edition of the Lakeland ePost. Click here to read.